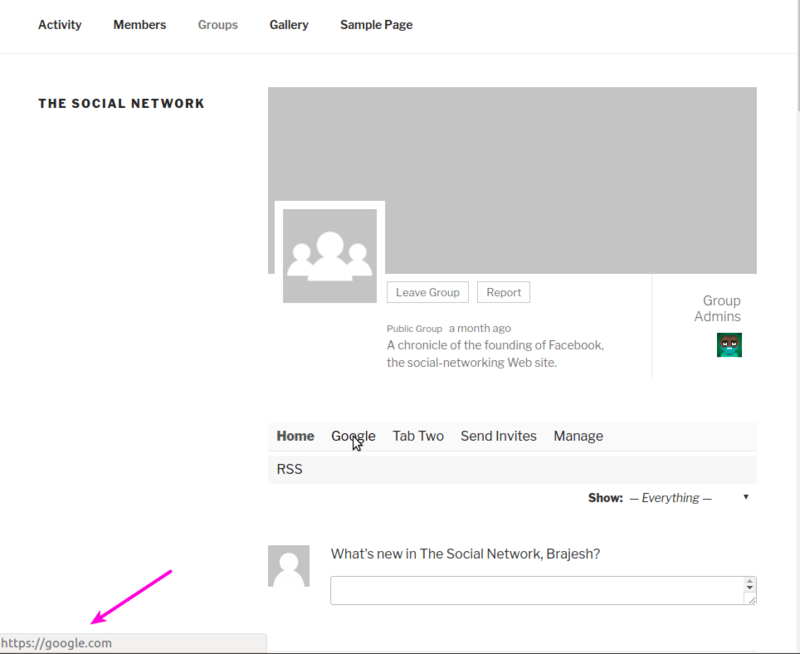 With BuddyPress Group Tabs Creator, You can overwrite the default BuddyPress group tab link if you need. 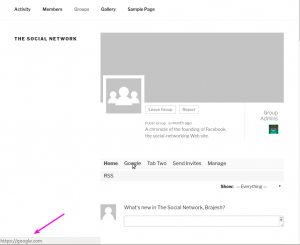 You can link BuddyPress group tab to any url of the web. Or you can create dynamic url that points to another tab/sub tab or page on site site. In order to override the default tab url, you will need to enter the new url while creating/modifying a tab. Here is a screenshot of the setting. It is completely optional and you should only use it if you want the tab to act as a link(dynamic or absolute). While creating or modifying a tab, you will see a box for entering link url as shown earlier. All we need to do is use the absolute url in this box. Here are the screenshots showing how to link to google. This is optional and if you don’t want to link to any special pages, you may avoid this. [displayed-group-url] – Dynamic url for the current BuddyPress group. For example, it will be like http://example.com/groups/some-awesome-group/. [logged-user-url] – Dynamic url for currently logged in user. [site-url] – Dynamic link to your sites home page. In case of multisite, it points to the main site home page. [blog-url] – Dynamic url to current blog. In case of normal WordPress site, [site-url] and [blog-url] are same. It occupies special meaning when used on multisite. Go ahead and explore the possibilities.